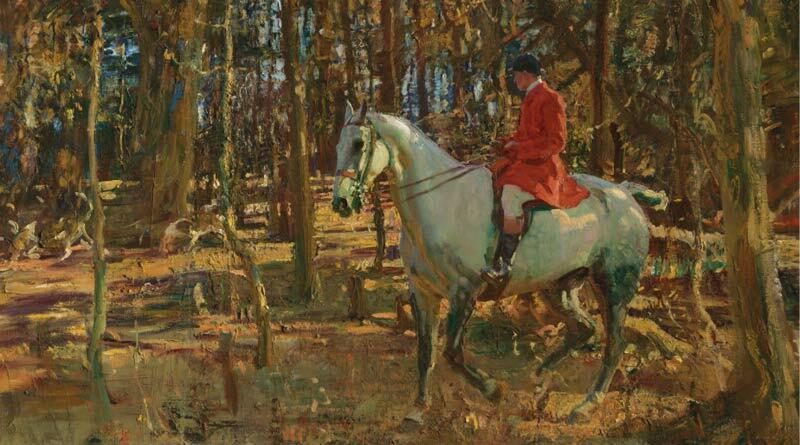 The whip, Trevelloe Wood, Cornwall, by Sir Alfred James Munnings, is being auctioned by Christie’s. A horse painting by renowned British equine artist Sir Alfred Munnings is expected to fetch up to £1.5 million ($US1.9m) at auction this month, with the proceeds from all works offered from the important private collection to benefit a charitable foundation. Christie’s in London will offer the oil-on-canvas work titled The whip, Trevelloe Wood, Cornwall, at its December 13 sale, comprising nearly 400 works from the private collection. The collection is being sold anonymously. Munnings is considered the greatest British equestrian painter since George Stubbs in the 18th century. He painted the work after moving to the artists’ colony at Lamorna, Cornwall, in 1911. Munnings was a great hunting enthusiast who rode with the Western Foxhounds. He painted a series of hunting subjects set against Cornwall’s woods, moors and cliffs. His model for these works was a local boy called Ned Osborne. The horse in the painting is most probably the grey mare which Munnings bought when he visited Ireland in 1913. The Whip, Trevelloe Wood, Cornwall is said to reflect a more spontaneous and fluid style for Munnings, marking the beginning of his mastery of reflective colour theory, which was to become one of his greatest trademarks. Christie’s says of the many works on offer: “The collection provides a remarkable window into the private world created by this collector in his homes in London, St Tropez and St Barths and demonstrates his unique and discerning eye. The catalogue can be browsed here.